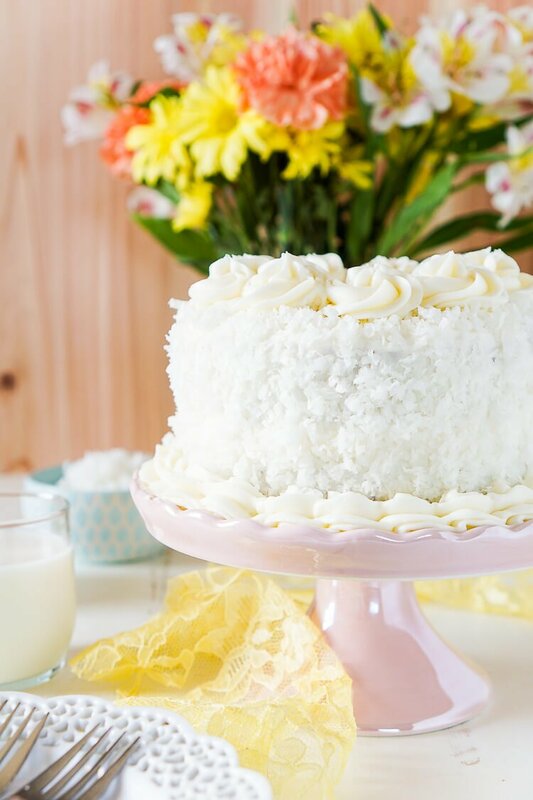 This Classic Coconut Cake is the perfect Easter dessert! 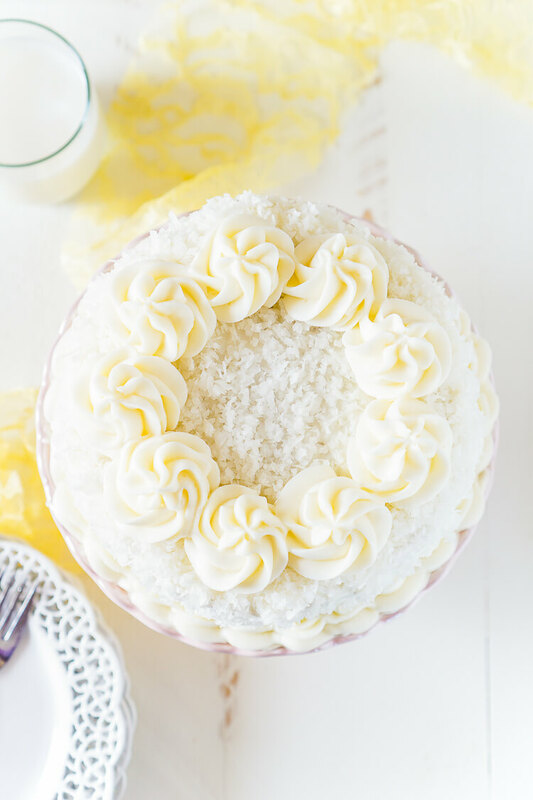 Light and fluffy with a cream cheese frosting laced with the essence of sweet coconut! And let me tell ya, light and airy is exactly what this cake is! I whipped my egg whites separately and then folded them into the batter for even more airiness. But it doesn’t have the texture of say a chiffon or angel food cake, it’s still quite moist! It’s exactly the kind of cake you’d want to make for Easter Sunday, or any day for that matter. 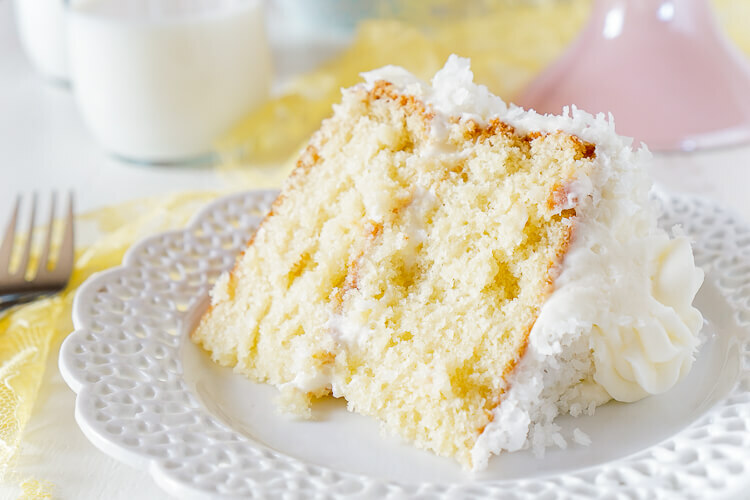 I love that the coconut carries just a sweet hint throughout the cake and the tang of the cream cheese in the frosting brings the whole thing to life. The frosting is silky and rich and when you sound it with a layer of minced coconut, you’re in for a real treat! Preheat oven to 350 degrees F. Line bottom of two 9-inch pans with parchment rounds and spray with non-stick spray. Add egg whites to a small bowl or stand mixer fitted with a whisk attachment and beat until stiff peaks form. If using a stand mixer, transfer egg whites to a small bowl and set aside. In a separate small bowl, combine the buttermilk and baking soda and set aside. Measure the sweetened flaked coconut out on a cutting board and mince even further, nobody like a stringy cake. Add minced coconut to a large bowl and mix in the flour. Add the sugar and butter to a large bowl or stand mixer and beat on high until fully combined. Scrape down the sides and beat in the egg yolks. Beat in the flour mixture and buttermilk alternately until fully combined, scraping down the sides as needed. Fold in the coconut extract and egg whites, evenly divide the batter between the two pans and bake for 35 to 40 minutes until toothpick comes clean. Remove from oven and let cool in the pan for 5 minutes before transferring to a cooling rack to cool completely. See notes for alternative sizes and measurements. Add cream cheese and butter to a large bowl or stand mixer fitted with a paddle attachment and beat on medium-high speed until fluffy. Slowly add in the sugar a cup at a time, alternating with the heavy cream and extract. Beat on high for 2 to 3 minutes until light and fluffy. Add more sugar or cream to reach desired consistency. Add bottom cake layer to a plate or cake stand and spread some frosting out on the top all the way to the edges. Add the next layer of cake and add more frosting to the top, spreading it evenly and down over the sides. 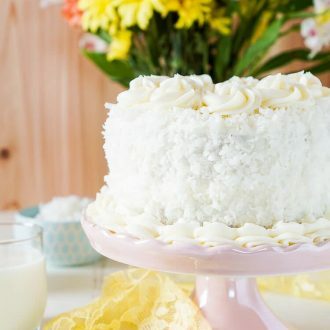 Gently use the palm of your hand to press shredded coconut onto the sides and top of the cake, pipe on additional decorative frosting around the base of the cake and on top if desired. Make a 6-inch 4-layer cake: 2 cups of batter per 6-inch pan, bake for 30-35 minutes. Make 24 cupcakes: 2 to 2.5 tbsp batter per cupcake liner, bake 18-23 minutes. Make a 6-inch 2-layer cake and 12 cupcakes: Follow guidelines above. Words cannot even describe how good that cake looks to me. I am swooning over here. WOW – you decorated that so beautifully!! 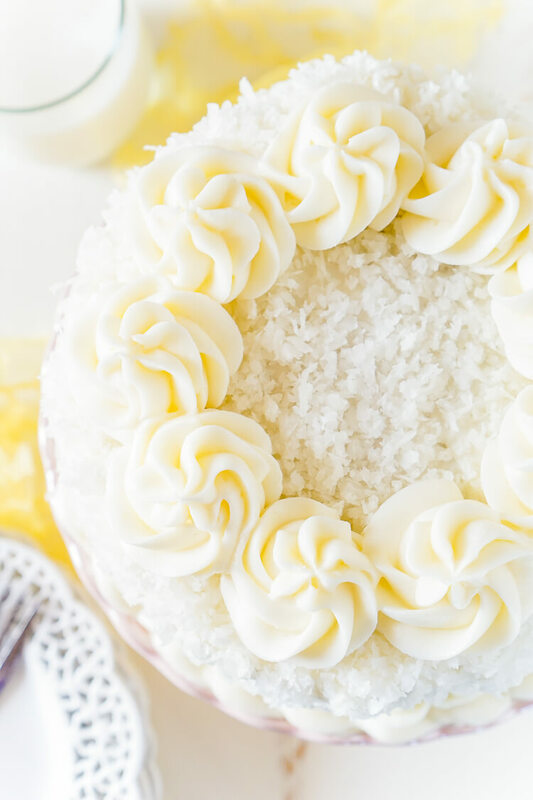 I love coconut cake, one of my all time favorites. That looks SO good. Thanks so much for the sweet comment, Kylee! I am a huge fan of coconut! Your cake looks so sweet and light! Just perfect for Easter! I think I may try to make this. My family would love this! Oh, I hope you do, they’ll love it! Mm, this cake sounds divine! And it’s so pretty, too! Coconut is one of my favorite flavors, but I don’t use it often enough. This cake has inspired me! Same here, we need more coconut in our lives! I love coconut cake. This looks gorgeous. You icing flowers look professional! That is a beautiful cake. It almost looks to good to eat, almost! Thank you so much, it definitely tasted amazing!